By Jon Fowlkes and Mike Long. All photos used by permission of Michael Long Photography. 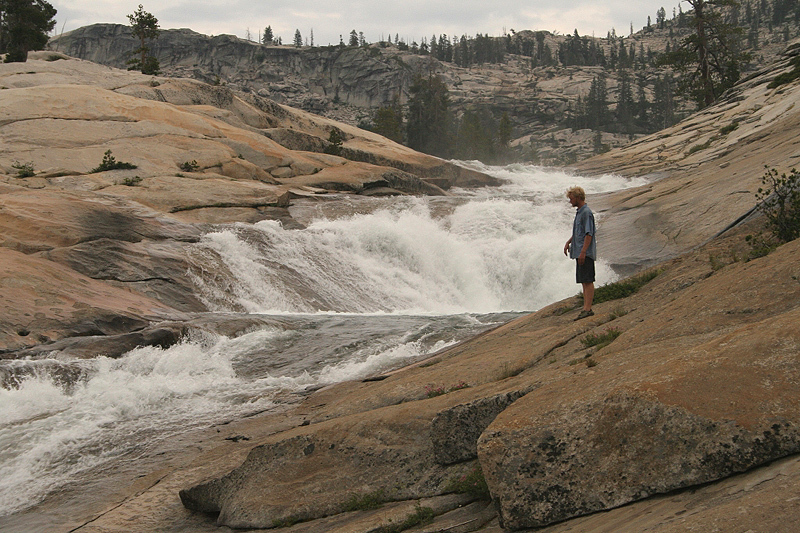 Location: California Sierras, a high water run in August of 2006. 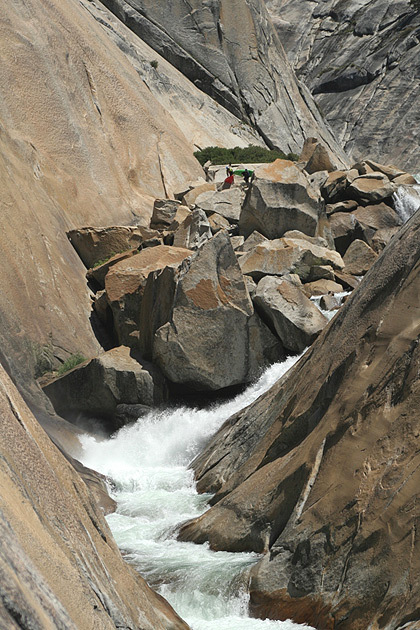 Nature: Classic steep creeking in an otherworldly granite wonderland. Mike and Jon shot video during this trip, and most of it is featured in Chuck Taylors PBR 2006 Film. Click here to watch PBR 2006. Copyright © 2006, Oregon Kayaking, Jon Fowlkes, and Michael Long. 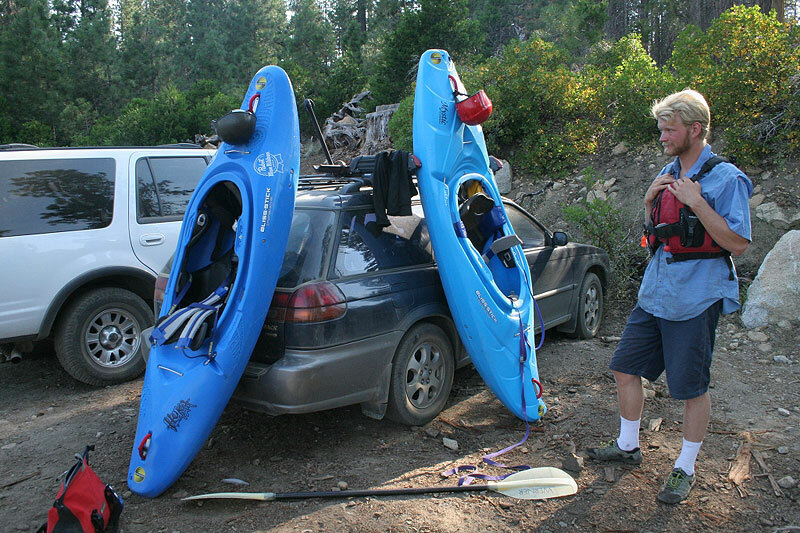 No part of this page may be reproduced, linked, or copied without the express written permission of the Oregon Kayaking webmaster, Jon Fowlkes, and Michael Long. Mike Long and I had dreamed of running Upper Cherry Creek for years. Whenever we talked about our 'Top Ten' list, it was right there, heading up the group. 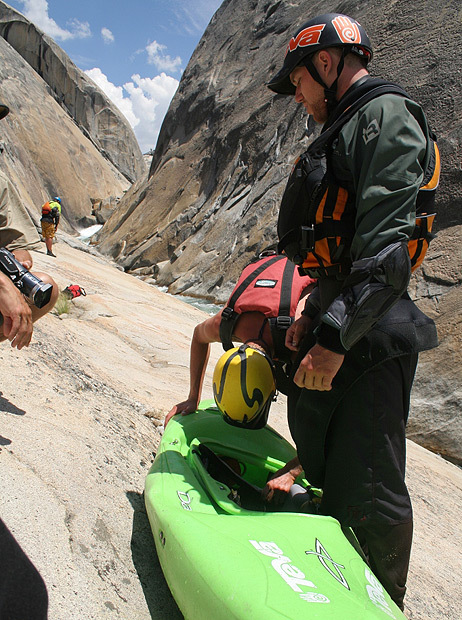 Our dream finally came true during our summer 2006 Cali Creeking trip. We were having a great time riding the runoff from the big Sierra snowpack, and Upper Cherry was on our minds. After a few days paddling in the San Joaquin drainage, we found ourselves at Cherry Lake where we ran into the McClarren Brothers from Idaho. They had just gotten off West Cherry Creek and were gearing up to hike into Upper Cherry the next day. Ambivalent about flows with rumors of high water, we paddled across the lake to check the level. When we arrived at the mouth of Cherry Creek, it looked like a dream come true: granite slides and falls as far as we could see. Fortunately the flow did not look high, and we reasoned that if thirty percent was coming in from West Cherry just a half mile upstream, Upper Cherry might be just right. We paddled back to our car in the dark and made plans to hike in the following day. After a lazy start, we rigged up a backpack carrying system using a single twenty foot strap each and a bit of closed cell foam. We laid out our meals, divvied up food and gear, and started up the trail. Jon Fowlkes gets ready for the long hike in to Upper Cherry. After the first mile, I tried to take the wrong fork; luckily Mike the boy scout caught it and we kept plodding up Kibbie Ridge. Surprisingly, there were a fair number of water sources along the trail including springs and ponds. We took our time, stopping for a little lunch and some snacks along the way. Soon we ran into Polk and the McClarren Brothers, their brightly colored boats standing out starkly against the white granite. Meanwhile, the clouds were gathering and we could see some showers in the mountains above us. At Styx Pass we stopped and enjoyed the view of the valley, and we could see other kayakers at the put-in below us. A few minutes later we joined them, happy to have our boats off our backs and shoes off our feet. The plan was to put on the following morning, arriving at Cherry Bomb gorge by the end of day one. We would camp near Cherry Bomb, then paddle out the following day. That night we celebrated with our new friends, enjoying the solitude of the place. Upper Cherry starts with a bang: Jon Fowlkes checks out the 'warm-up' falls just below the put-in camp. A beautiful sunset, taken the night before we put on. The next morning brought some worry. The stick we had poked into the sand as a gauge the night before was covered by five inches of water in the wide pool next to camp. The creek had come up significantly overnight, which meant that the gorges downstream would be pushier and harder, and the crux section through Cherry Bomb Gorge might be too high. A couple people hiked out, but most though it would be "doable". After some hesitation, we decided to go for it and joined up with John Grace and some of the LVM crew who knew the lines. There is no warm-up on Upper Cherry; around the corner from camp was a multi-tiered slide/falls with some stout holes to punch. Toby McDermott showed us how it was done, and we all followed shortly. A few hiked up to run the warm-up falls a couple times.. it was so much fun! Dropping the warm-up falls on Upper Cherry the next morning.. Things mellowed out for a bit as we bumped down a bunch of wide open, low angle slides in the bottom of the U-shaped granite valley. Looking upstream into the granite valley near the beginning of Upper Cherry. The gradient began to pick up once we entered the u-shaped granite valley, with some longer complex slides eventually depositing us at the '420' or 'Class IV gorge'. 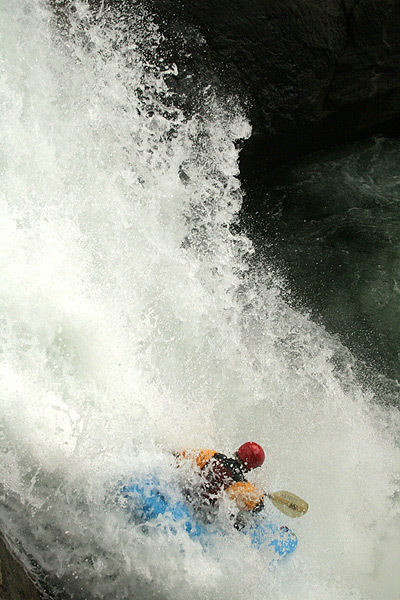 In the 420 gorge the canyon walls narrowed dramatically and we had some harder whitewater to run. At these flows, the holes were stout and there was little recovery time between drops. We ran down in groups of two and three, setting safety for each other as we went. Soon we arrived at Gorilla, named for it's twin on the Narrows of the Green. Toby ran Gorilla and gave his Gus a face lift and Itor the Spaniard following suit with his overloaded boat..
Toby Macdermott runs the rapid named 'Gorilla' for it's similarity to the big one on the Narrows of the Green. He smashed the bow in on his boat at the bottom of this drop. Tobys run over Gorilla is featured in Chuck Taylors PBR 2006 film. Click here to watch the film. Below Gorilla we had a couple of swimmers at random holes who were quickly pulled out along with their gear. Suddenly, the gorge walled opened up again and we floated through a meadow which deposited us at the start of Cherry Bomb Gorge. Camping on night two above the crux section in Cherry Bomb Gorge. 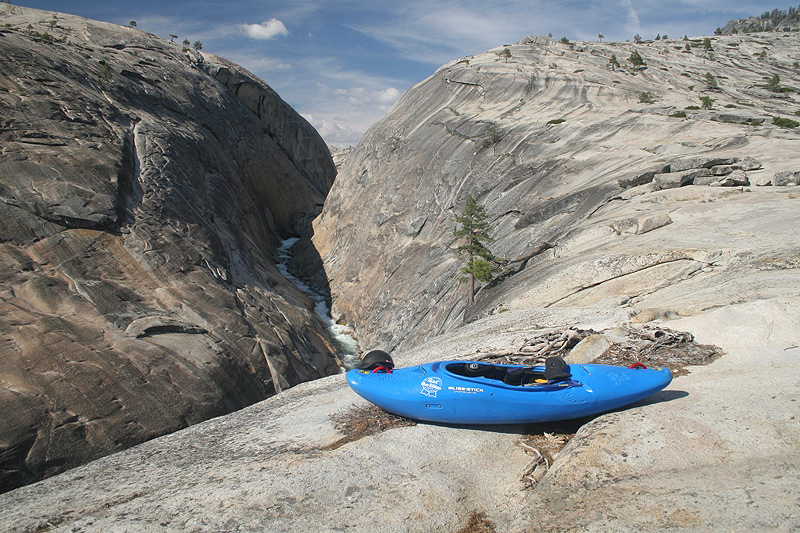 The general consensus was that Cherry Bomb Gorge was probably too high to run when we arrived, so we left our boats and hauled our camping gear up and over the enormous granite dome to camp at the bottom. That afternoon and evening we hiked around in the gorge, checking out the drops and swimming in the pools. From inside the gorge, it was clear the level was at the upper end of runnability, with the mandatory forty-foot entrance falls posing a significant hazard to anyone choosing to enter the gorge. At this high flow much of the water coming from the forty footer was hitting the far wall, meaning that paddlers would have the narrowest of landing zones in an already extremely technical drop. This falls is full-on; you can't go right because it dumps into a stomping terminal eddy/whirlpool with no way out and no rescue options except to swim for a month or two until the level drops. You also can't go too far left because of a knob rock guarding that side. What remains is a middle-left line on this falls that you must run absolutely perfectly with no margin for error whatsoever, with severe consequences for a mistake. Feeling strong but humble, both Mike and I ( along with almost everyone else ) decided it would be best to come back and explore this gorge at a more reasonable flow. We shlepped our boats down in the morning and headed into the gorge to watch/film/set safety for those who were dropping in. Looking down into Cherry Bomb Gorge. This one starts with a difficult forty-foot entrance falls which is followed by a series of tough drops between vertical walls with no way to set safety. Out of the thirty or so paddlers there, five decided to giv�er. Two ran into trouble in the first gorge leading to Cherry Bomb and had a sketchy climb up a crack to escape above Cherry Bomb Falls. 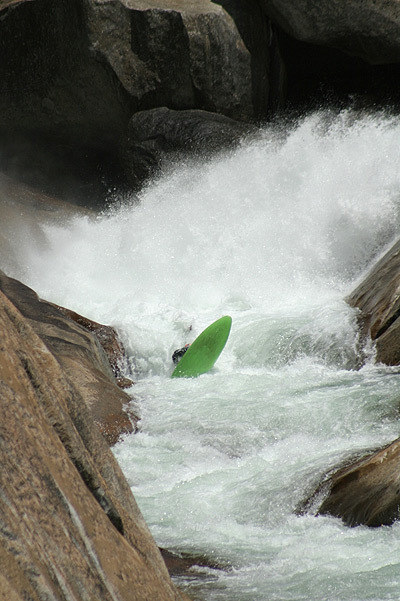 Eventually, three of the five paddlers appeared at the portage above Cherry Bomb, scouted the falls, and fired it up. The first two made it to the bottom of the gorge without swimming, though they were clearly struggling through some of the holes. That left one paddler above Cherry Bomb Falls. Three out of the five who entered the gorge actually made it to Cherry Bomb Falls. The remaining three scout the falls in this photo, figuring out their lines through the gorge. 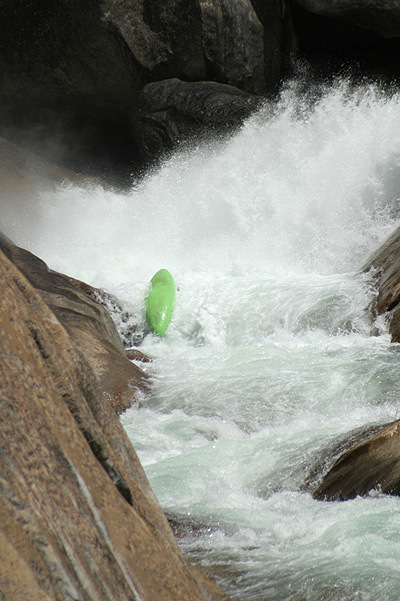 Rush Sturges was the last paddler to enter Cherry Bomb gorge, and he broke his paddle upon impact off of the forty footer. Rush was totally on his own at this point, and he had a long way to go between vertical walls below the entrance falls before we could reach him with a rope. 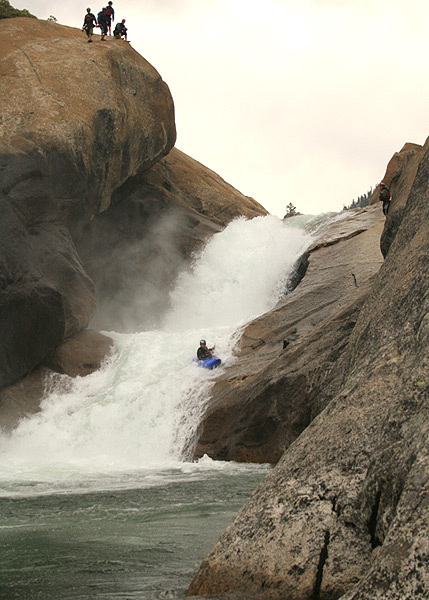 What followed is the most amazing feat of paddling I have ever witnessed on a river. Rush fell into the drop just below the entrance falls upside-down and backwards with only half a paddle. This drop contains a very sticky hole and is known as the Weir. He worked his way out of the Weir with half a paddle, rolled up and began a C-1 decent of the gorge. He quickly realized that the half paddle was throwing him off balance, so he tossed the blade and proceeded to hand paddle through three massive holes downstream, boofing, surfing, and knocking off hand-rolls. Finally in the worst of the holes he was forced to swim and grabbed onto the river left gorge wall. 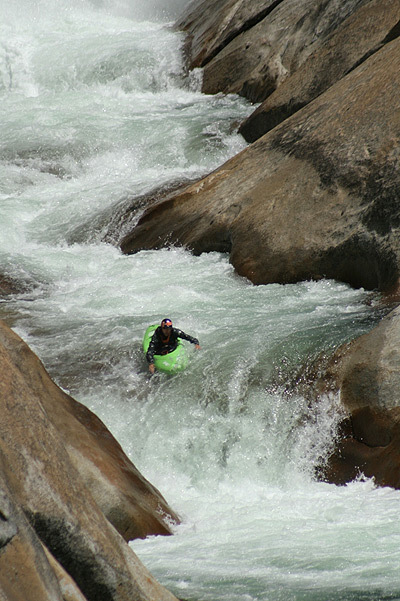 His boat floated down and jammed under an undercut boulder just downstream. We got a rope to Rush and swung him onto river right, then extracted his folded boat from under the boulder using brute force ( eight guys pulling on a rope ). A few minutes in the sun and his boat popped back into shape as we all headed downstream towards the takeout. 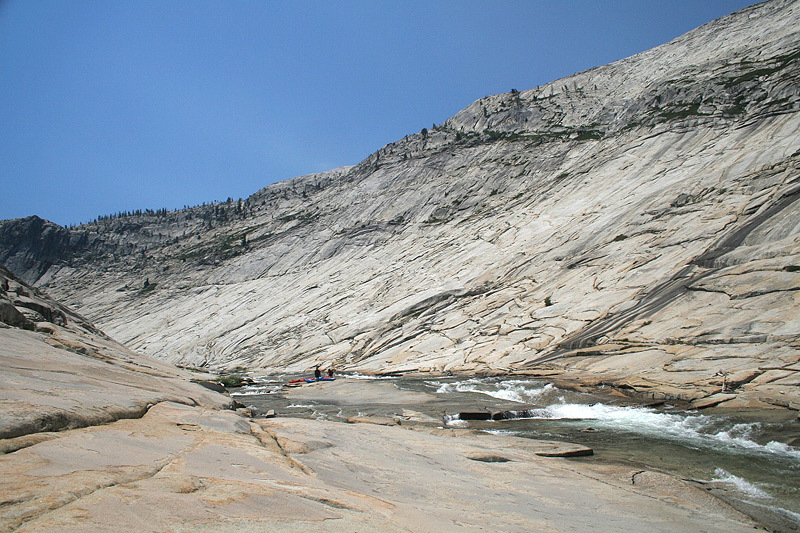 Rush's amazing run through Cherry Bomb Gorge is featured in Chuck Taylors PBR 2006 film. Click here to watch the film. 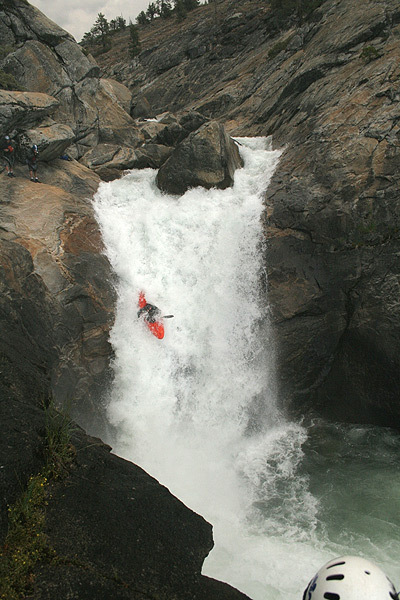 Rush Sturges steps up big-time in Cherry Bomb Gorge after his paddle snaps running the forty-foot entrance falls. He managed to fight his way out of the The Weir with half a paddle but was forced to hand-paddle the rest of the gorge at high water.. Rush tosses his broken paddle aside because it was throwing him off balance. 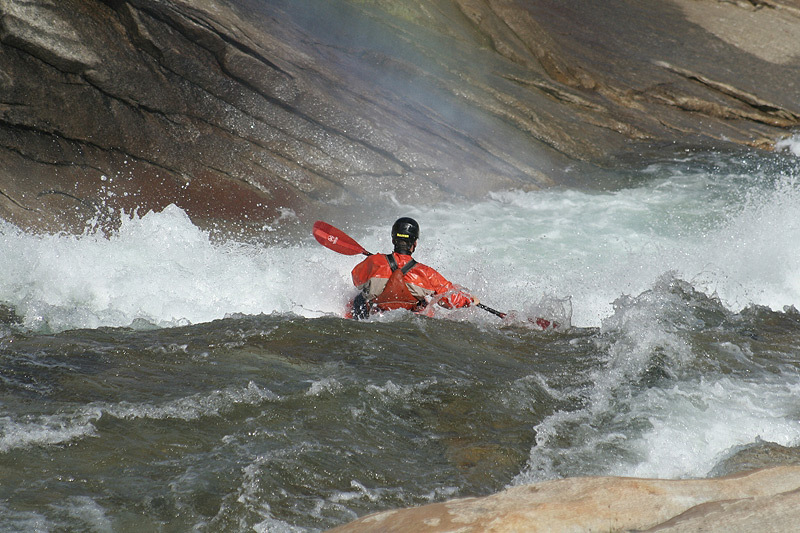 What followed was the most amazing feat of paddling I have ever witnessed on a river. John Grace anchors the team as we give Rush's boat the ol' heave-ho at the bottom of Cherry Bomb Gorge. Checking out the Rush's Nomad, which held up really well in spite of getting badly pinned on a rock. The section of river between Cherry Bomb gorge and Cherry Lake has to be one of the sweetest pieces of whitewater on earth. There was Zoom Tube, Perfect 20, double pothole drop, pothole gorge, Kiwi in a Pocket, Dead Bear falls and a fun class IV-V paddle out through a couple more little gorges. For the most part, everything went smoothly with the occasional swim/pounding. Below Dead Bear it started raining pretty hard and with only granite to fall on, the water all ended up in the creek and the level rapidly rose. The last mile was a chaotic dash down big-water features packed into a tiny creek. We ran everything that day but 'Kiwi in a Pocket' and one manky drop in the lower gorge. The younger McClaren brother runs Double Pothole Falls. Pat Keller fires up Dead Bear Falls. Jon Fowlkes drops Dead Bear Falls. 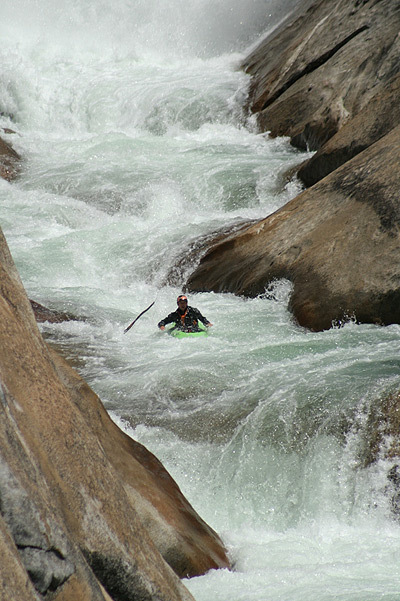 Upper Cherry was one of the biggest highlights of my paddling career to date. 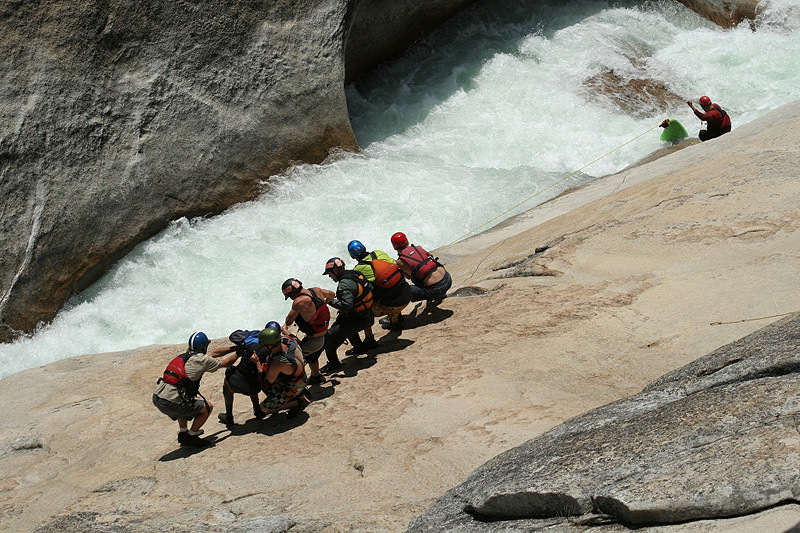 The gorges are spectacular, the camping fantastic, and the whitewater is out of this world. We will be going back soon. All of that said, this is not a place for aspiring class V boaters. The drops are demanding, the portages difficult and the consequences of a mistake disastrous. You are miles from the nearest road and getting to a hospital could take days. That said, this was an experience I will never forget. 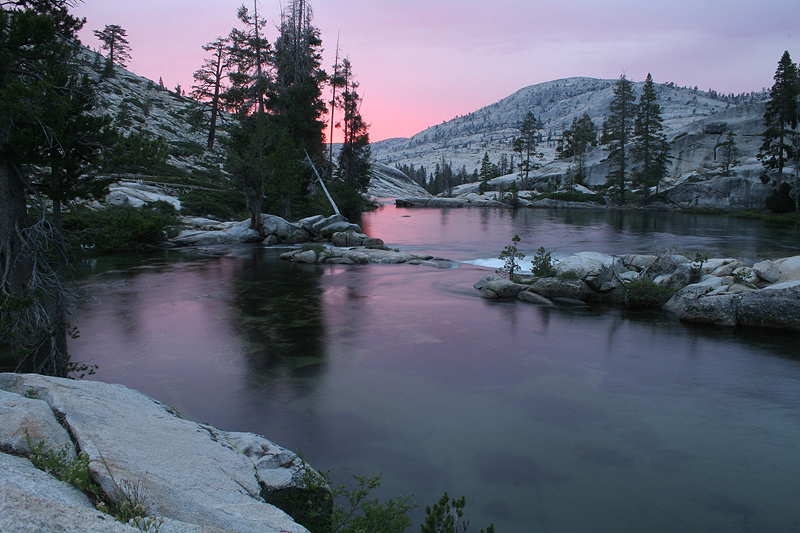 Cherry Creek flows into Cherry Lake, due east of San Francisco in the Stanislaus National Forest. 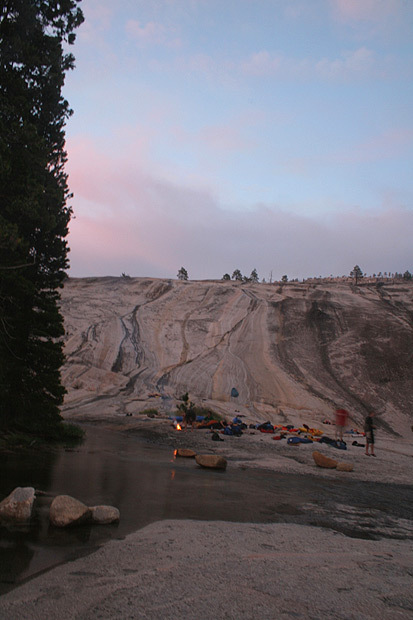 The nearest town is Tuolumne which is a twelve and a half hour drive from Portland. 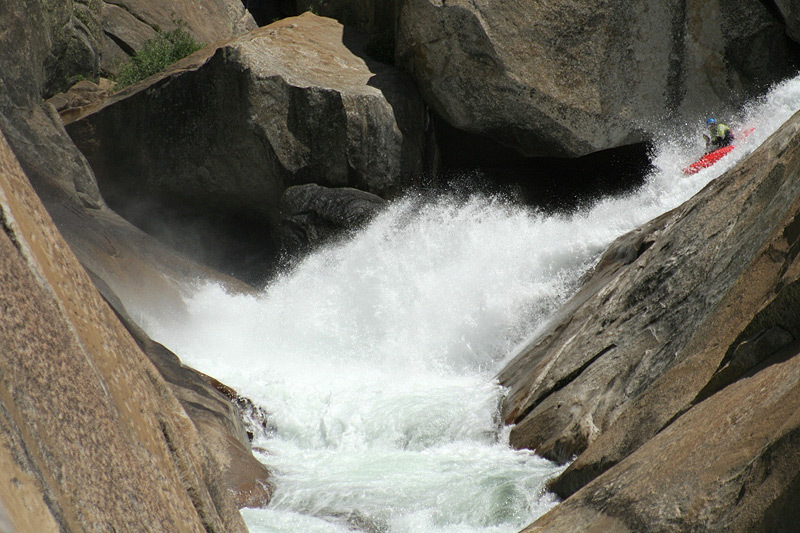 This is a snowmelt run and flows in the summer if there is an adequate snowpack. 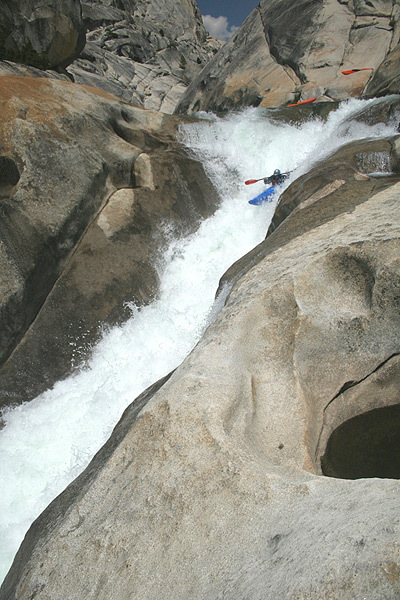 There is a ton of other boating in the area, so be sure to pick up the Stanley / Holbeck book 'The Best Whitewater in California - 3rd Edition' to get the scoop. Upper Cherry isn't in that guidebook, but other runs in the area are and it will give you a good idea what is going on in the immediate vicinity.